Golf has been played over the links at Gullane for more than 350 years. Today, Gullane Golf Club is one of Scotland's most prestigious member clubs, mixing the finest tradition with some of the most admired natural links land in the world. Gullane is blessed with superb turf and a climate that allows all year round golf. Visitors are welcome to play our championship courses which offer dramatic coastal views and a golfing challenge to savour. Laid out over prime seaside land, the three golf courses are simply known by number reflecting their age. We have 4 flyovers available to view. Click here to view a flyover of all the courses. More information on this can be found in the Courses section of the site. Gullane No. 1 (1884) has a long history of hosting national and international championship golf events. The Club was delighted to host the 2015 Aberdeen Asset Management Scottish Open and has also previously hosted Local Final Qualifying for the Open Championship at neighbouring Muirfield. The last time this was held was in 2013. I've played at Gullane several times, and love number 1. The third course has many fond memories when I really could not play golf but enjoyed bashing it around on a Sunday morning then meeting the girls for lunch to be followed by a horse ride- hack- and then Chinese at The Loon Fung. A good weekend! At the starters box for a tough opening hole and an even tougher second. Chris W, Kevin Keady and Eric S.
The "new" Clubhouse at Gullane; there was none of this fancy stuff with a roof and a place to change your shoes in my youth; Gullane Number 3 has lots of memories for me. I had just started working, dating Gill and the lads would go play Gullane number 3 no matter the weather, but had to be a 7am tee off, in order to finish in time to meet the girls for lunch somewhere like Haddington. The perfect day would then roll on to a hack - horse riding to you - and then a Chinese dinner at the Loon Fung in Cannonmills preferably. Awesome, then back to work Monday for a rest! Looking back down the ferocious second hole. Well, well: controversy at the 2018 Scottish Open! 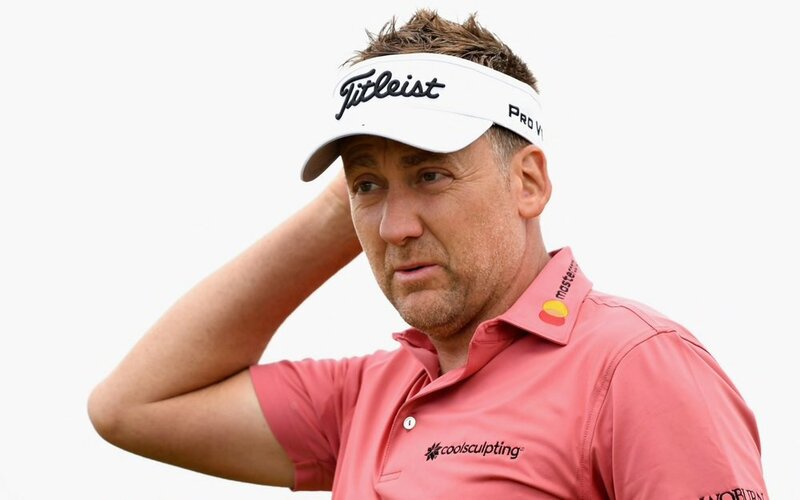 By Alex Myers Ian Poulter of England reacts after his par putt on hole two during day two of the Aberdeen Standard Investments Scottish Open at Gullane Golf Course on July 13, 2018. One of my better pictures capturing the light and awesomeness of Gullane number 1! I never realized Mr Jardine as a golfer nor quite such an outspoken chap, but I loved some of his Bob Skinner novels. This is a description of number 1. The website has more information on each course. Course No. 1 The history of Gullane No. 1 Course stretches back to 1884. Carved into the ancient links turf with pot bunkers, wispy grasses and smooth-running greens the course is a unique challenge for the serious golfer. Add to that the fabulous views across to Edinburgh, the Firth of Forth, Fife and beyond and you have one of the world’s most cherished golfing experiences.